There were no public shelters constructed in the village, it was left to individuals to look after their own welfare. The majority of people constructed their own shelters made out of any material that was forthcoming. By far the most popular was the Anderson Shelter, the basic material supplied by Mr Cousins at the Eight Bells Garage. In November 1938, Chamberlain placed Sir John Anderson in charge of Air Raid Precautions (ARP). He immediately commissioned the engineer, William Patterson, to design a small and cheap shelter that could be erected in people's gardens, this became known as the "Anderson Shelter"
Within a few months, the government provided half a million of these shelters free of charge to those earning under £350 a year, and only charged £7 for those who earned above this amount. It was made up of several pieces of strong corrugated steel and could easily be assembled by homeowners in their backyards. In some instances the shelter was covered in soil and turf offering better protection. The shelter usually had a raised floor to prevent flooding and was equipped with a couple of bunks, table and small cupboard. Non-perishable foods, water and children's toys were also kept in the shelter. Nights spent in the shelter were generally uncomfortable - they were small, cold and damp, with little air circulation and only a pot for a toilet. 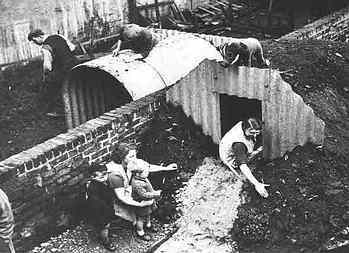 In March 1941 the government began issuing Morrison Shelters. Named after the Home Secretary, Herbert Morrison, the shelters were made of very heavy steel and could be put in the living room and used as a table. One wire side lifted up for people to crawl underneath and get inside. When not in use as a shelter it could be used as a table (see illustration) by temporarily removing the welded wire mesh sides. Whilst the Anderson was constructed of 14 corrugated sheets, and required some digging to let it into the ground, the Morrison consisted of some 219 parts (not including 48 nuts and bolts) and came with 3 tools with which to assemble it. Morrison shelters were fairly large and provided sleeping space for two or three people.